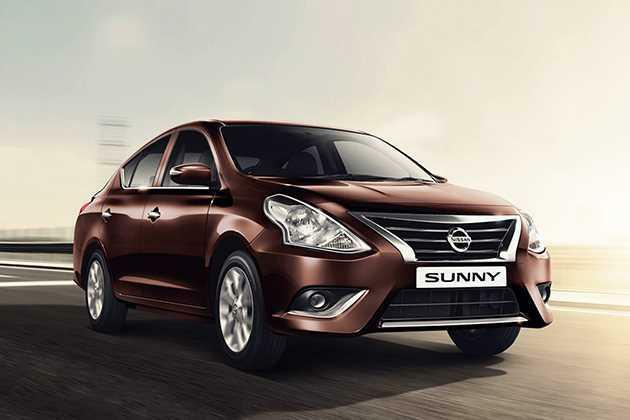 Nissan Motors, the fully owned subsidiary of Japanese automaker has introduced the facelifted version of Sunny. This time, the automaker has introduced the vehicle in five diesel variants among which, the Nissan Sunny XV D Premium Leather is one of the top end version. This trim is powered by a 1461cc diesel motor that is capable of producing 84.8bhp at 3750rpm and pumps out a peak torque output of 200Nm. This latest version comes with refined exteriors and interiors along with improved comfort features. In terms of exteriors, it gets Y-shaped, 12-spoke alloy wheels along with redesigned headlight cluster and a pronounced radiator grille. Its internal cabin received a revamped dashboard and a glossy finish central console, which is further decorated with metallic inserts. It is integrated with a multi-functional display along with a drive computer that is equipped with a tachometer, digital clock and several other warning lamps. This variant comes with leather seats as optional, which renders an upmarket look to the cabin. In addition to these, it is incorporated with a parking sensors and a rear view camera, which provides acoustic warning and visual images on central infotainment screen. On the other hand, the company is now offering a 2-DIN music system along with Bluetooth audio streaming and call function. This facelifted version comes with a modified front facade, which gives a modernistic look to the vehicle. On its front profile, it has an updated chrome radiator grille that is embossed with a company logo. It is surrounded by a newly designed headlight cluster, which is powered by halogen lamps and turn indicators. The front bumper is also modified, which is now integrated with a pronounced air dam along with a pair of fog lights. The overall new look of the front is complimented by chrome plated strips fitted to the fog light console. The rear profile remains identical to the outgoing variants but its bumper is fitted with a black protective cladding. Coming to the sides, its external mirror caps are slightly modified, which are further incorporated with side blinkers. Apart from this, the remaining aspects have been retained. Its wheel arches have been paired with a set of 15-inch alloy wheels , which are further covered with tubeless radial tyres. The door handles are garnished in chrome, while the window sills are affixed with black sash tape. This vehicle comes with a total length of 4455mm along with an overall width of 1695mm. Its height is slightly increased to 1515mm and its wheelbase remained to be same at 2600mm, which is quite good. The manufacturer has improved the interiors with a refined greige color scheme, while treating the central console with a glossy piano black. Its cabin is done with premium scratch resistant plastic along with high quality leather upholstery, which gives an upmarket finish to the cabin. The dashboard along with the central console have been revamped and are accentuated by brushed metallic inserts. It also comes with a newly designed leather-wrapped, three spoke steering wheel that is mounted with multi-functional switches. All the seats have been covered with premium leather upholstery and are integrated with head restraints, which render additional comfort. The manufacturer has installed several utility based features inside like a large storage box, front and rear cup holders, door pockets, bottle holders and a day/night inside rear view mirror. This variant also comes with an advanced 2-DIN music system including a color display that supports AUX-In socket , USB port and Bluetooth connectivity. The main highlight of this sedan is its rear cabin leg space owing to the large wheelbase of 2600mm. Powering this variant is a slightly refined 1.5-litre, K9K diesel motor that complies with Bharat Stage IV emission norms. This engine has 4-cylinders and 8-valves that receives fuel through a common rail injection system. This SOHC based motor can develop a maximum power output of 84.8bhp at 3750rpm and yields a hammering torque output of 200Nm at just 2000rpm. This power plant is skillfully paired with a 5-speed manual transmission gearbox that distributes the torque output to its front wheels. This vehicle is now capable of producing a peak mileage of 22.71 Kmpl, which is fairly decent. This facelifted version is blessed with a highly proficient braking mechanism in the from of front discs and rear drum brakes. It is further assisted by anti lock braking system and electronic brake force distribution, which keeps the vehicle stable even on slippery roads. As far as the suspension is concerned, its front axle is paired with McPherson strut and the rear axle is mated with torsion beam type of mechanism . On the other hand, it is incorporated with a sophisticated electric power steering that provides excellent response at all times. The new Nissan Sunny XV Premium Leather is one of the top end variant that is incorporated with several luxurious features. The manufacturer is also offering this vehicle with leather seats as standard, which provides enhanced comfort to the passengers. Apart from this, it has aspects like an automatic air conditioning system including rear comfort fan and air filter , which regulates the air temperature and keeps the ambiance pleasant. The list of other features include electric power steering with tilt adjustment, 12V accessory power socket, front and rear power windows with one touch auto down function, central door locking, sun visors with passenger side vanity mirror and room lamp. In addition to these, the company has installed remote boot opener, driver's seat height adjuster, remote key-less entry, manual anti-dazzling inside mirror and an intelligent key with push button ignition. This variant comes with a few crucial safety aspects, which can protect the passengers in case of any unlikely events. The company has installed 3-point ELR seat belts, dual front airbags and added protection beams to its body, which safeguards the passengers in case of accidents. This vehicle is also blessed with aspects like front fog lamps, speed sensing auto door locks, and door ajar warning . On the other hand, the company has installed engine immobilization system along with an anti-theft device featuring an alarm, which prevents any unauthorized access to the vehicle. 1. Revamped exteriors gives it a trendy new look. 2. Performance of the engine is quite decent. 1. Price range is slightly expensive. 2. Safety standard needs to be improved.